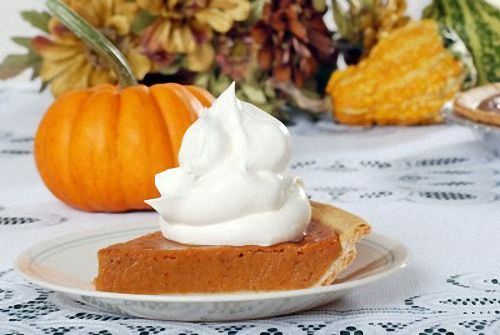 Grandma's best Thanksgiving pie recipes make it easy to host an old fashioned Thanksgiving Day meal. Whether you make the familiar squash or pumpkin pies or you make the potato custard, grape, or crabapple pie, you'll be pleased to set these delicious dessert pies before your guests. Mom's favorite recipes for homemade pumpkin pie were jotted down in the kitchen while I watched and questioned her. 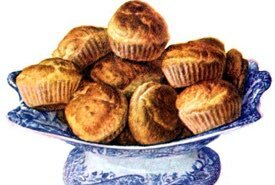 That was the only way I could get her best Thanksgiving pie recipes and reveal exactly how she did things, for she often cooked by inspiration instead of by recipe. Though they are perfect for Thanksgiving, these homemade pies made from scratch are wonderful for serving at any time of the year. Warning: They are so good tasting that you'll want to make more than one! One large can of pumpkin (about 14 oz). Let it simmer without a cover for about 15 minutes. 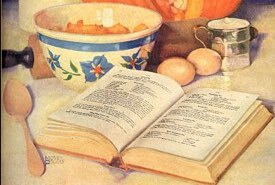 Put through a sieve, and let cool before adding: 3 eggs well beaten, 2 cups milk, 1/2 cup Evaporated Milk, 1/2 cup sugar, 2 tablespoons maple syrup, 1 generous tablespoon melted butter, small 1/2 teaspoon grated nutmeg, 1 teaspoon cinnamon, 1/2 teaspoon powdered ginger, 1 teaspoon salt. Quantity should be enough to fill two regular-sized pie shells. 1 cup brown sugar, 1/2 teaspoon salt, 1 teaspoon cinnamon, 1/2 teaspoon mace, 2 eggs slightly beaten, 1 14-oz can pumpkin (398 mL), 1/2 cup milk, 1/2 cup cream. Mix together thoroughly brown sugar, salt, cinnamon, and mace. Stir in eggs, add pumpkin and blend. Stir in milk and cream, previously scalded. Bake for 20 minutes in very hot oven (450°F), then reduce heat to moderately slow oven (350°F) and continue baking about 25 minutes longer. 1-1/2 cups pie filling makes 1 large pie. Nicely mashed potatoes, 1-1/2 cups; sugar, 2 cups; milk, 1 quart; eggs, 5; a little salt, and any flavoring desired. Directions: Beat the eggs well, mix all, and dip into the pans made ready with the usual paste, or crust, and bake the same as any custard pie. 4 eggs, 1/2 teaspoon salt, 1 cup sugar, 2 cups raisins, 2 cups sour cream. Beat eggs slightly. Add salt, sugar, raisins and cream. Mix thoroughly and pour into unbaked pie shell. Bake in hot oven (400°F) 10 minutes. Reduce temperature to 350°F and bake 20 minute longer, or until custard is firm. Cover with meringue made by beating 2 egg whites until stiff and adding 2 tablespoons powdered sugar. Return to oven to brown meringue. Crust: 1-1/2 cups whole wheat flour, 3/4 teaspoon salt, 1/2 teaspoon baking powder, 1/2 cup shortening, cold water. Method: Sift dry ingredients, cut in shortening and gradually the water (about 6 tablespoons). Divide pastry in half, toss one part on floured board and line 9-inch pastry pan. Filling: 1 cup cut pineapple, 1 cup raisins, 1 cup apples, 1/2 cup sugar, juice of 1 lemon, rind of 1/2 lemon. Method: Chop fruit, add sugar and juice, and grated rind of lemon. Turn into the pastry-lined pan, cover with second crust. Bake in hot oven (450°F) for 15 minutes, reduce heat to moderate (350°F) and continue baking for about 40 minutes. Serve hot or cold with a generous mound of vanilla ice cream. 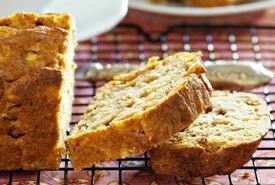 One pint of boiled dry squash, one cupful of brown sugar, three eggs, two tablespoonfuls of molasses, one tablespoonful of melted butter, one tablespoonful of ginger, one teaspoonful of cinnamon, a pinch of salt, and one pint of milk. This makes two pies, or one large deep one. Pop the pulps out of the skins into one dish and put the skins into another. Then simmer the pulp a little over the fire to soften it; remove it and rub it though a colander to separate it from the seeds, if any. Then put the skins and pulp together and they are ready for pies, or for canning, or for putting in jugs for other use. Very fine for dessert pies. The above photo was taken nearby our house. 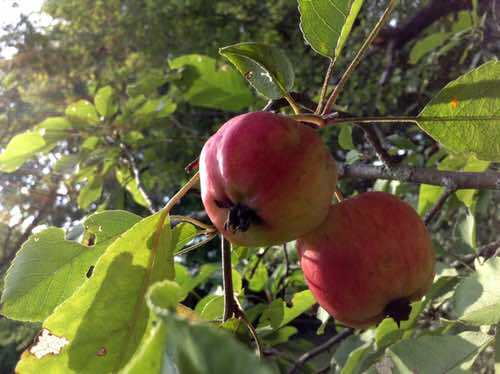 The old crabapple trees are bountiful some years, and the tiny, tart apples are perfect for pie making. Mom considered this to be one of her best Thanksgiving pie recipes when the crabapples were in season. Enjoy. Line pie pan with crust, sprinkle with sugar, fill with crabapples (or tart apples) sliced very thin, sprinkle sugar and a very little cinnamon over them, and add a few small bits of butter, and a tablespoon water; dredge in flour, cover with the top crust, and bake half to three-quarters of an hour; allow four or five tablespoons sugar to one pie.